I teach a STEM enrichment class for children age 2.5 – 7, called Family Inventors’ Lab. We’re a cooperative program, which relies on parent volunteers in the classroom. Once each quarter, a parent is responsible for bringing and serving snacks for the whole class. As a working parent of a small child, I understand life is busy, so I always say it’s totally fine if they just bring in anything they happen to have in the cabinet. But… if they WANT to tie into the theme of the week, they can. If they WANT to lead a “cooking” activity, they can. This post is my collection of ideas to match each of the themes this year. These are also all easy ideas for snacks to go with any science-themed birthday party. What is an Inventor? Provide some kind of “invented food.” For example, instead of fresh blueberries, a natural whole food, provide freeze-dried blueberries – where a scientific process has changed and prolonged the edible life of the blueberries. Or microwave popcorn – a natural whole grain which has other ingredients added to it, and then a modern technology is used to cook it. Tall Structures. Build a tower of food, also known as a fruit kebab: bring bamboo skewers, and fruit, cut into cubes… bananas, melon, blueberries (whole), strawberries, pineapple… Kids build their tower on a skewer, then eat it. Engineering: Tunnels and bridges. Build structures with food: provide toothpicks and cheese cubes or grapes or cubes of French bread or melon balls or marshmallows, let children build their structures, then dismantle and eat. Rube Goldbergs & Contraptions. Use a kitchen gadget to prepare something: like an apple slicer, a hard-boiled egg slicer, an ice cream scoop with the lever that releases the ice cream, a veggie spiralizer, a pasta maker, a cheese grater, etc. Pulley Red licorice ropes to tie onto a snack and haul the snack up. Inclined plane Graham crackers and grapes (they can roll the grape down the cracker ramp). Wedge & Lever. Make your own fruit salad. The littlest kids can slice bananas or watermelon with table knives or plastic knives (wedges). Middle-size kids can use scissors (levers) to snip marshmallows (or grapes). Older kids cut apples, or oranges with a sharper knife. You could also use a melon baller (a wedge). Screws. Refrigerated make-your-own crescent rolls – you’re rolling an inclined plane up to make a screw shape. Plus apples to use with the Apple Peeler and Slicer that we have in the classroom. If I Built a Car. Make a mini-car. All of these have an idea for a car body and for the wheels: Cheese sticks and mini bagels, cheese stick and pepperoni slices, apples slices and grapes, cut in half. A breadstick and cucumber slices. Banana and oreos. If I Built a House. Simplified (and healthier) gingerbread houses: graham crackers for walls, cream cheese or sunflower seed butter to be the “cement” to stick walls together. and dried fruits for decorations. Electricity. Something that you need electricity to prepare. 🙂 For example, fruit smoothie in a blender: have them practice mashing up a little food by hand to see what hard work that is, and then put food in the blender and whir it quickly. Wind and Flight. Some kind of “puffs” (Pirate booty, puffed Cheetos, puffed cereal) and straws. They can use a straw to blow around ONE puff while they eat the rest. Mixtures, solutions. Pancakes or a birthday cake to go with the books recommended in the theme. Kool-Aid, or some powdered drink (solid) that they mix with water (liquid) and it dissolves/mixes. Light and Shadow Oreos? (And milk to dip them in.) Or something with distinctive silhouettes (like animal crackers) that they could shine a bright flashlight at and see its shadow on the table before eating it. Geology: Earth & Earthquakes. 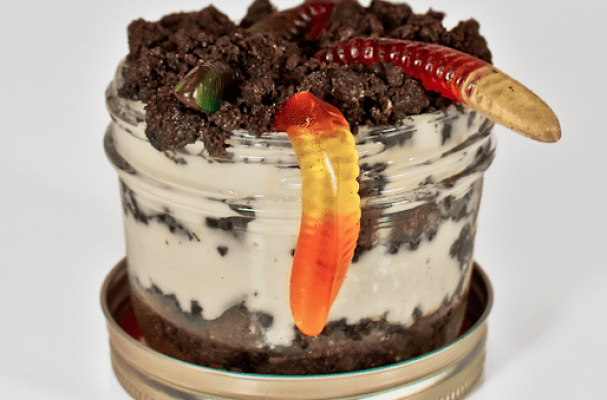 We’ll be talking about the layers of the earth, so a yogurt parfait where kids layer together yogurt, fruit and granola, or a mud cup where they layer chocolate pudding, bananas, crumbled graham crackers (or oreos), and a gummy worm. Dinosaurs. There are dinosaur shaped cheese puffs, chicken nuggets, and more. Or there’s Dinosaur Egg oatmeal. Planets & Astronauts. Trader Joe’s sells rocket shaped cheddar crackers. Horizon makes a graham cracker that’s cows jumping over moons. There’s astronaut ice cream. Or you could do some kind of food in a tube or a packet like the astronauts eat. (like an applesauce packet) You could also make something that looks like a planet.. like Jupiter pizzas: English muffins spread with tomato sauce and cheese and heated in toaster oven. Or bagel and cream cheese moons. Stars & Constellations. Trader Joe’s has star shaped yogurt covered cookies. Campbell’s makes chicken and stars soup. Or you could bring star shaped cookie cutters and slices of American cheese to cut. Categorizing Animals: Animal crackers. Encourage them to sort them, count how many they have of each kind, describe them, etc. Habitats. Make blue jello with Swedish fish floating in it? Bring animal crackers, give kids a paper plate labelled with place they might find the animals (desert for camel, jungle for monkey, etc.) When they get their crackers, they first sort them into where they belong, then eat them. Or get cheddar bunnies and goldfish to mix together, and kids have to sort into which lives in water, and which lives on land. Adaptations to Environment. We do an activity called Bird Beak Adaptations. Tie into that by providing some snack with a utensil that makes it harder to eat… Can they eat spaghetti noodles with chopsticks? How about raisins? Or diced canned peaches? Or can they eat yogurt with a fork? Or drink yogurt with a straw? Or some similar challenge… Let them use tongs (like bird beaks) to serve the food. Eggs. Hard-boiled eggs, prepped in advance. Or cook eggs together so they see the process of breaking the shell, scrambling, cooking, etc. If they’re not fans of eggs, then make a cookie recipe or something else that incorporates eggs. Seeds, Flowers and Plants. Sunflower seeds, pumpkin seeds, peas, edamame / soybeans. Or fruit with obvious seeds (cherries, seeded watermelon, peach, etc.). American cheese slices, and flower shaped cookie cutters. Something flavored with lavender or rosewater (though many kids don’t like these flavors). Birds & Flight. There are recipes for “bird’s nests” made with chow mein noodles and butterscotch chips. Could make those, or use some other combination of items for bird’s nests: maybe pretzel sticks and sunflower seed butter? Robots & Machines. A bowl of snack mix… pretzel rods, cheerios, and Chex with a sign saying “nuts and bolts” and string cheese or licorice ropes with a sign saying “wires” and maybe some candy shapes for “buttons”. For almost any theme, you could find cookie cutters that relate to the theme, and you could use them to make sugar cookies or biscuits or other recipes, or you could use them to cut American cheese slices, or bread, or many other things. If you don’t want to bring the theme related snack, then any of the following are always winning combinations: apples and cheese; graham crackers and bananas, pita and hummus, goldfish crackers and grapes, and so on. We do have a nut free, peanut-free policy in our classrooms. Always bring two items (two kinds of food). If you only bring one item and a hungry child either doesn’t like that food or is not able to eat it due to allergies, then we have a hungry and unhappy child in class! Providing two types of food means that’s less likely to occur. So, for example, if you’re bringing cheese crackers, you could bring fruit to go with them. Or if you’re bringing cookies, maybe also provide yogurt tubes. At CDL, we have for serving: disposable cups for water, and disposable plates (snack boats). We have spoons and forks. For preparing: we have mixing bowls, measuring cups, typical kitchen utensils, a microwave and a toaster oven. If you need something specific, ask if we have it, or just check yourself the week before. At Robinswood, for serving, we have: re-useable cups, plates, and silverware. (Part of the snack parent’s job is to unload and reload the dishwasher.) For preparing, we have mixing bowls, measuring cups, kitchen utensils, pots and pans, a microwave, stove, and oven. Again, if you need something specific, ask us.